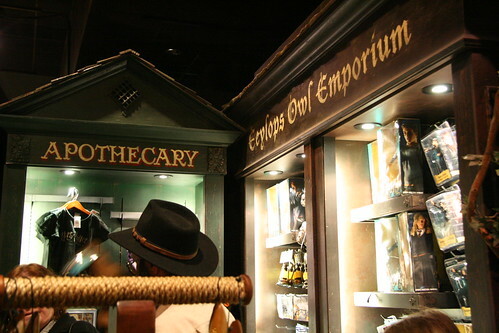 We went see the Harry Potter Exhibition a second time with the express purpose of taking photographs in the store. The first time around, I was gunshy about taking illicit photographs, which kept my camera under wraps in the store as well. This time, I saw other people taking secret photographs in the exhibits, but I didn't dare whip out my huge DSLR. I drank in the sights again and noticed a few extra things that I missed, such as the Time Turner, and the fact that dementors do have pseudo pelvis with no leg sockets, where the tail bone extends down several feet below it. 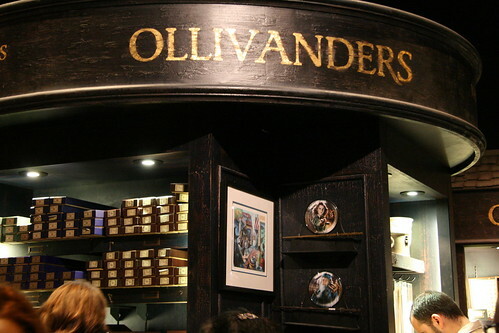 As soon as you walk into the Harry Potter Exhibition store, you immediately walk up to Ollivander's Wand Shop. Maker of Fine Wands Since 382 B.C. 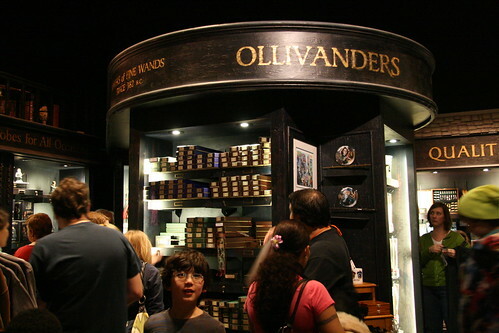 Boxes and boxes of wands to choose from (but really the wand chooses the wizard or witch). 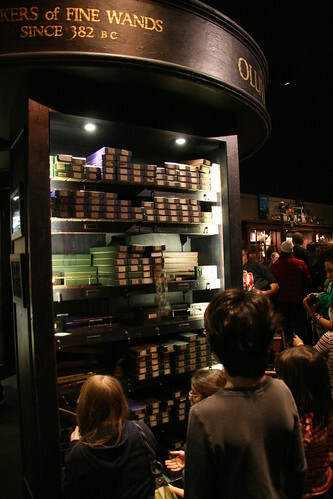 Besides taking pictures, I also wanted to purchase Dumbledore's wand (the elder wand). I was going in with an open mind and if Hermione's wand spoke to me I would get that instead. When I tried them out, the elder wand definitely felt right to me, but Hermione's wand spoke to Dova. Now, I couldn't tell her that only Adam and I could have wands, so Hermione's wand was added to the list of extravagant purchases. 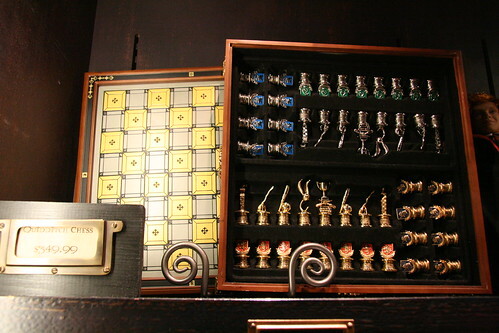 I didn't notice the display of Hermione's and Dumbledore's wands until after I viewed this photograph at home. 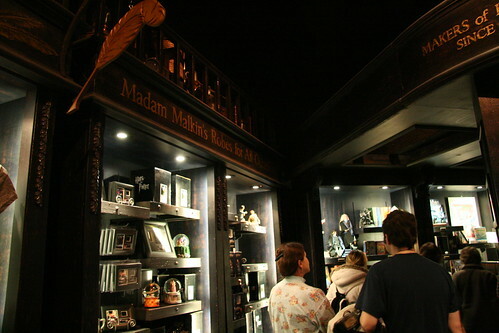 Next stop is Madam Malkin's Robes for All Occasions. No robes here, just knick knacks. 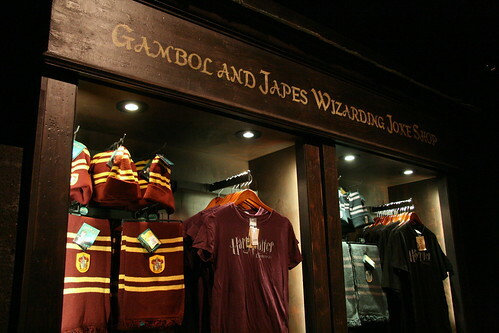 You can find clothes at Gambol and Japes Wizarding Joke Shop. They really ought to be at Madam Malkin's. 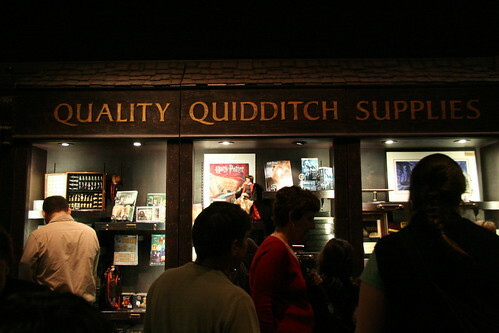 And no Weasley's Wizard Wheezes shop. 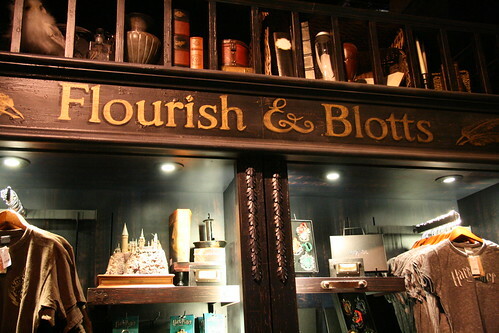 You can find the Harry Potter books and DVDs at Quality Quidditch Supplies, but not at Flourish & Blotts. What gives? This Diagon Alley may not be so authentic after all. 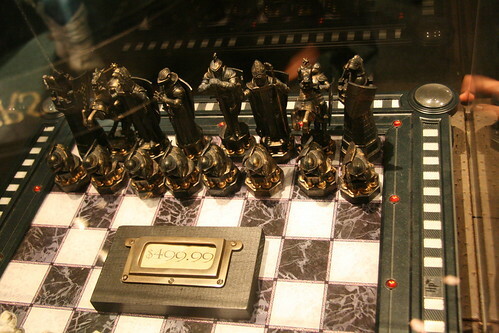 For a mere $499.99, you can purchase this wizard chess set. Very cool, but probably not magical. Look at the detail in those gorgeous pieces! There was a full size pawn inside the exhibit. 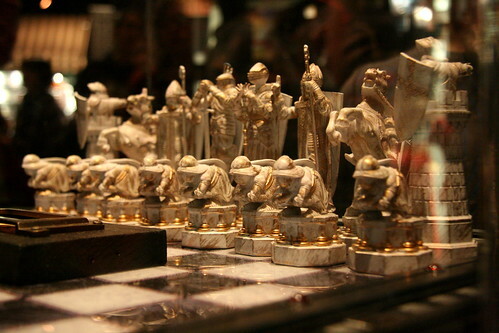 If you can't afford that, this Quidditch chess set is available for $349.99. What a bargain! 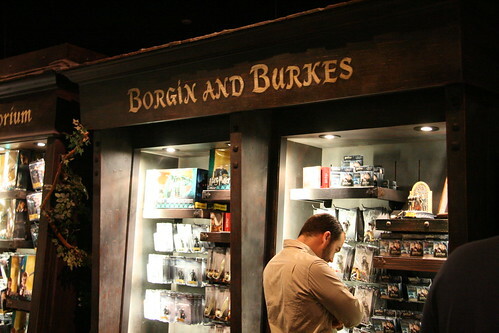 Beware of the dark magic objects at Borgin and Burkes! Down near the Apothecary and Eeylops Owl Emporium, we finally found some treats to eat. We bought two chocolate frogs, which are chocolate with rice crispies. Even with the collectible card it was hardly worth $3.99. We got Gilderoy Lockhart (gag me!) and Donaghan Tremlett, bass player with Myron Wagtail, lead singer of a popular wizarding band. Got the Fudge Flies as well, no flies, just cheap chocolate. 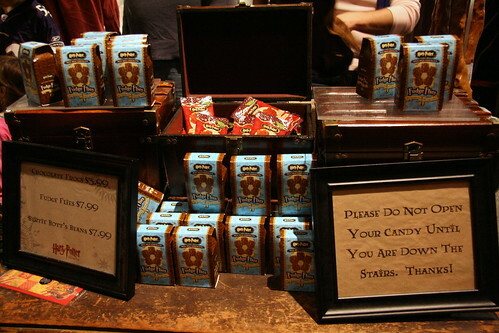 But we knew to stay clear of Bertie Bott's Beans after our previous experience. 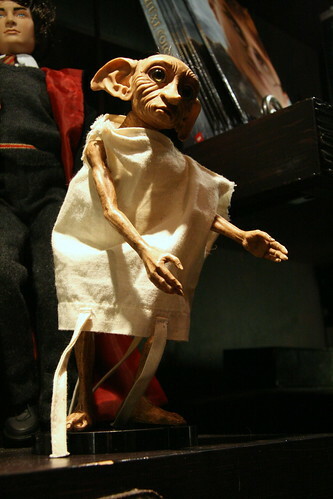 There were plenty of figurines, but only Dobby the elf looked real. I finally found the nicer artifact section with this painting and owl cage, and what's that stone? 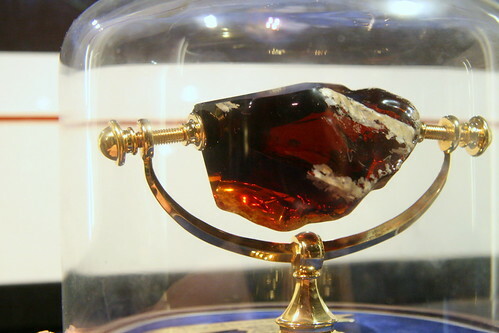 A replica of the Sorcerer's or Philosopher's Stone! 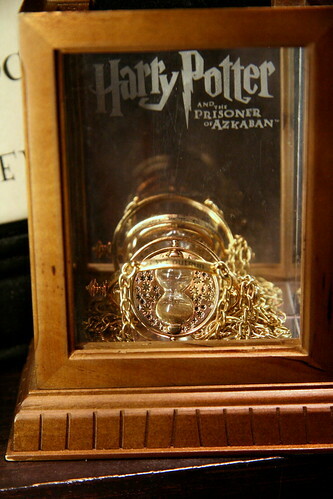 The Time Turner would be really cool to have. Especially if it worked. 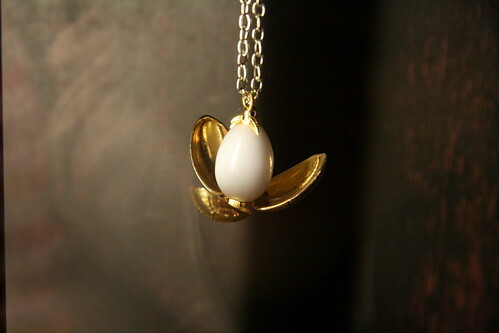 The Golden Egg was beautiful. 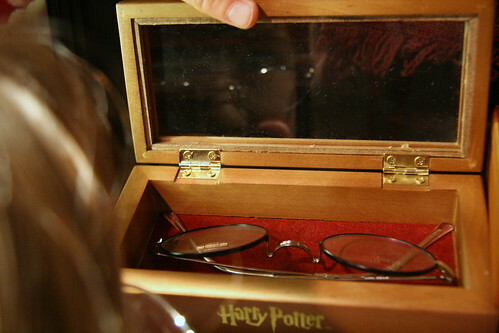 Dova peered into this box with Harry Potter's glasses. Adam really wanted the glasses, but not being prescription would be a problem. 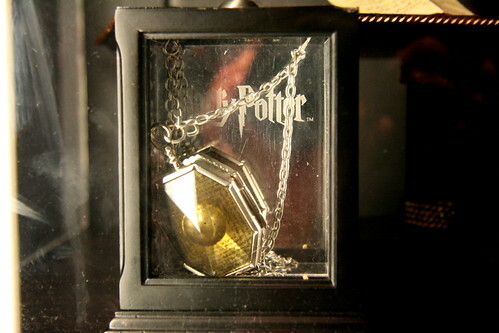 The most chilling piece of jewelry was the horcrux locket. 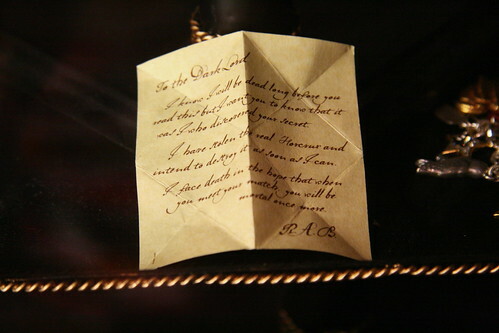 Complete with the note from R.A.B. At this point the cashier told me that photography was not allowed as the store was part of the exhibit.. Adam looked at me in shock. I thought this was ridiculous because you could buy these objects and take them home to photograph. I just shrugged my shoulders and smiled. Oops! YOu are a photography rebel!!! Authentic or not, I know a few kids would would LOVE to visit that place!!!! What a fun tour of a fabulous store. Thank you for risking being their to take pictures. Fantastic post! You made it quite a ways without being caught though. :) Neat place. I think I need to give in and read Harry Potter some day. I keep hoping my kids will love Harry Potter stories as much as I do! Great photos! You are not allowed to take those photos!! I mean it! Those stores are gorgeous! They did a good job making it look like authentic. That is silly! Glad you took them and shared them with all of us! P.S. 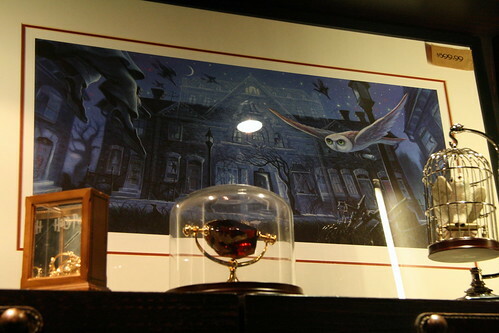 That Sorcerer's Stone is gorgeous! HP was wearing seme kind of glasse just like Adam and Dova's glasses. I think mothers in fictions and real life are very much alike. That is SO awesome! I'm going to have to show my hubby - he'll want to go to Boston! 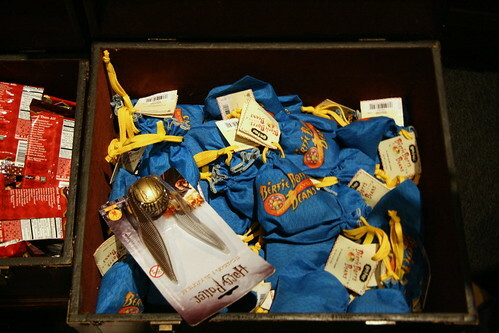 Did you happen to see how much the time turner necklaces were?